Sprint members are development team members who are responsible for driving the completion of user stories in the sprint. They do not just involve in the development, but they play significant roles in driving the completion of story. You can assign user stories to those sprint members so that they can carry on managing/executing the development activities. In this article you will learn how to add user stories to members. Note that this feature is only available for team project (VPository/Teamwork Server). Once you have adding members into a sprint, you can assign user story to a team member by taking the steps below. Open the sprint by clicking on it. 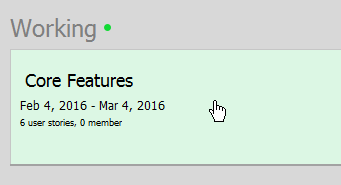 Click on the Members icon to open the members configuration page of this page. 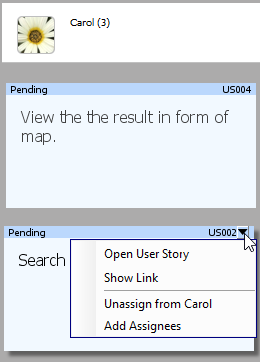 The unassigned user stories are listed on the left hand side of the page. Press on a user story and drag it to a team member column to assign him/her with the user story. In a member column, user stories are ordered based on their priorities. Therefore, when you drop the user story, make sure you are placing the story at the right position that reflects its priority. If a user story has to complete earlier, you better consider placing it at a higher position. A story can be handled by multiple team members. To assign another team member to a user story, take the steps below. Click on the tiny triangle at the top right corner of the story. 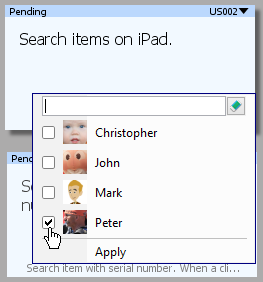 Select Add Assignees from the popup menu. Then, choose the extra member(s) and select Apply. The user story appear will then appear under multiple member columns. To remove an assignment, you can drag the user story from a team member column back to the Unassigned User Stories section. Alternatively, click on the tiny triangle at the top right corner of the story and select Unassigned from %MEMBER_NAME% from the popup menu. NOTE: If a user story has been assigned to multiple team members, by dragging the user story to Unassigned User Stories section will cause the story by unassigned from all team members.